“Finally another blog” – Twas the cry from the depths of the Internet. I know, I know and once again I apologise. Been so busy with work, baby prepping the house and everything else, mixed in with a serious lack of blog content. But as usual in the next few weeks the blog content is likely to go completely the opposite way, lots coming up so hopefully it’ll become a little more regular once again, so please please keep checking back. A quick Wilson Wednesday this evening, just so you can keep an eye on what those H.C. Wilson boys are upto. As it goes the above photo is a good place to start and it’s not even officially a Wednesday job, but I didn’t think you’d be too fussed about a days difference between friends. 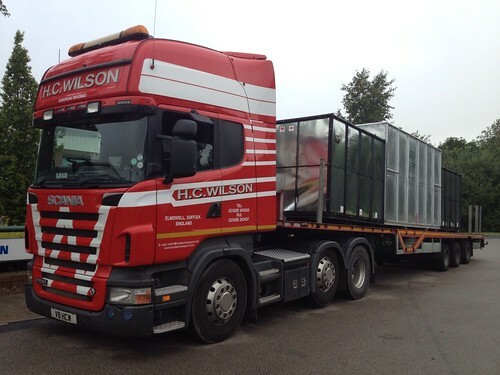 Each year H.C. Wilson and top Wilson customer, Portcentric Solutions have to do a delivery to a large estate in Sussex. 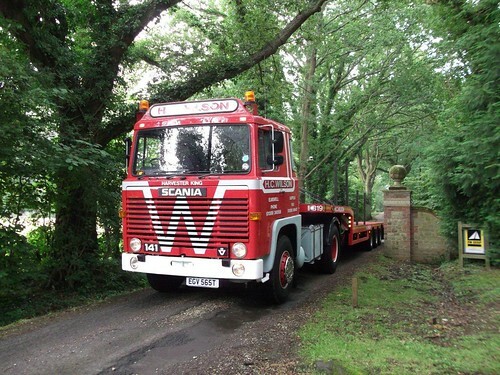 For no real reason other than it’s a nice little jolly out for the directors of both companies, it has now become a little outing in Wilson’s legendary Scania 141. 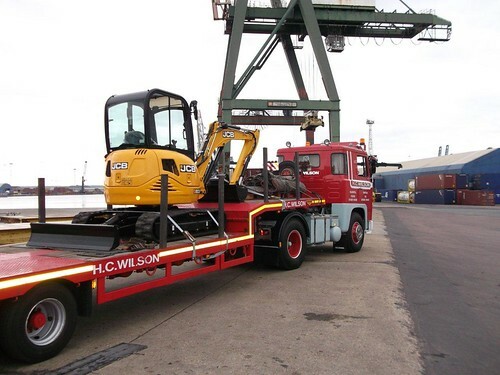 So loaded up and ready to roll, drop a larger machine at Tilbury dock on the way and then onward to the country lanes of Sussex. Thanks to top retro, Yorkie bar eating trucker, David Baker for the photos. Next, H.C. Wilson driver, turned office boy, now day relief driver James Cartwright was out and about today in V8 HCW, a Scania R580, delivering a load to Leamington Spa that he loaded in Felixstowe yesterday. An office boy having a night out??? (wait til next week – its not only happening at Wilsons!). The gorgeous Scania R560 V8 of Owner Driver Mike Tasker is also keeping busy backwards and forwards to the continent. 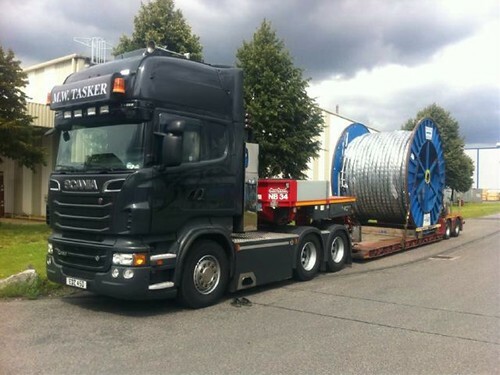 This time having loaded a cable drum from Koln, Germany heading back to the UK. 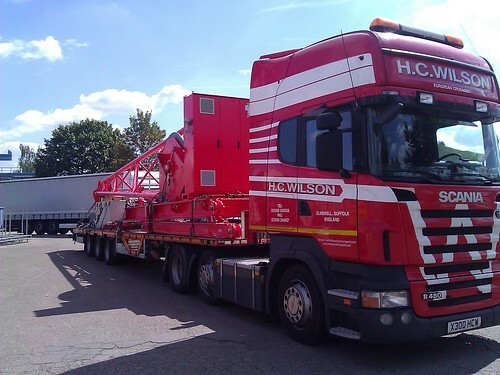 Looking good pulling a 2 axle Nooteboom low loader. 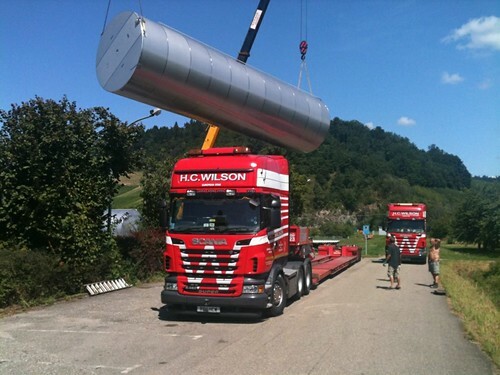 Last but by no means least 4 of Wilson’s were busy loading some 16.50 metre long storage tanks from South West Germany today in the 34’c heat. That’s 16.50 metres in the well of the trailer, not overall. These tanks are all night moves out of Germany heading to the ferry out of Rotterdam. So a long night ahead for drivers; Richard Arnold, Mark Blunt, Dave Knappett and top geordie driver Steve Pattison. Great photos, thanks Geordie…Don’t worry the German Rozzers are there to help! 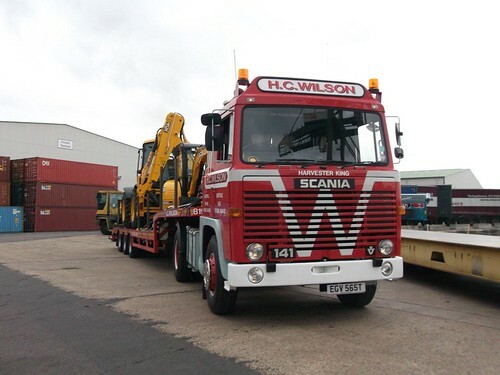 This entry was posted in Drivers Photos, HC Wilson, Heavy Haulage, International Mega Trucking, Photos, Scania by truckbloguk. Bookmark the permalink. top blog this one! 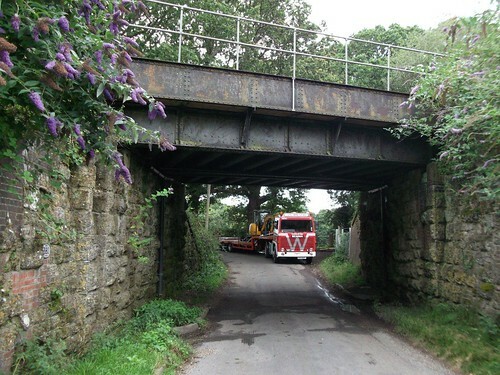 but no mention of the country lane chaos! it was totaaal gridlock maaan !!! Yea I will e doing a little extra blog with a few more pics. Have you got any more to share with Mr Bakers?? is there a blog coming about the MRCT 141 wrecker?